It is well recognized that there is an intimate and reciprocal interaction between epilepsy and sleep. 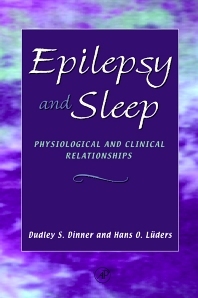 The book, Epilepsy and Sleep is a ground-breaking, comprehensive source for exploring this correlation and is especially timely because of the considerable growth in the understanding of the physiology underlying both sleep and epilepsy. An insightful reference, it presents many of the complex physiologic mechanisms underlying epilepsy--sleep interaction and highlights sleeping disorder symptoms that may be related to epilepsy. The annual cost of treating epilepsy in the United States is an estimated $12.5 billion, according to a report issued January 2000 by The Epilepsy Foundation. The Foundation also reports that more than 180,000 Americans develop epilepsy each year. However, thousands more cases may be misdiagnosed as sleeping disorders, causing these figures to jump significantly. This correlation and diagnosis can help determine the correct type of medication to administer to regulate the symptoms, in turn saving hundreds of hours of lost time at work and millions of dollars. Contributors. Preface. Relationship of Epilepsy and Sleep: Overview, D.S. Dinner and H.O. Lüders. Electrophysiology of Sleep, F. Amzica and M. Steriade. Physiology Underlying Reationship of Epilepsy and Sleep, M.N. Shouse. Sleep Deprivation and Epilepsy, P. Kotagal. Generalized Epilepsy and Sleep, S. Noachtar. Focal Epilepsy and Sleep, M.R. Sammaritano. Epilepsy in the Neonate and Infant and Sleep, M.S. Scher. Cyclic Alternating Pattern and Sleep, L. Parrino and M.G. Terzano. Electrical Status Epilepticus of Sleep, C.A. Tassinari, S. Meletti, L. Volpi, G. Rubboli, R. Michelucci, and H. Brunnschweiler. Acquired Epileptic Aphasia, C.A. Tassinari, S. Meletti, G. Rubboli, R. Michelucci, L. Volpi, and H. Brunnschweiler. Sleep Disorders in Epilepsy, N. Foldvary. Non-Rapid Eye Movement Parasomnias, B.A. Malow and M.S. Aldrich. Rapid Eye Movement Sleep Behavior Disorder, C.H. Schenck and M.W. Mahowald. Nocturnal Paroxysmal Dystonia and Frontal Lobe Epilepsy, S. Rona. Cataplexy, C. Guilleminault and L. Palombini. Video Electroencephalography and Polysomnography, B.R. Wolgamuth, J.C. Bulacio, and D.S. Dinner. Postictal State, D.R. Nair. Index. The Cleveland Clinic Foundation, Cleveland, Ohio, U.S.A.